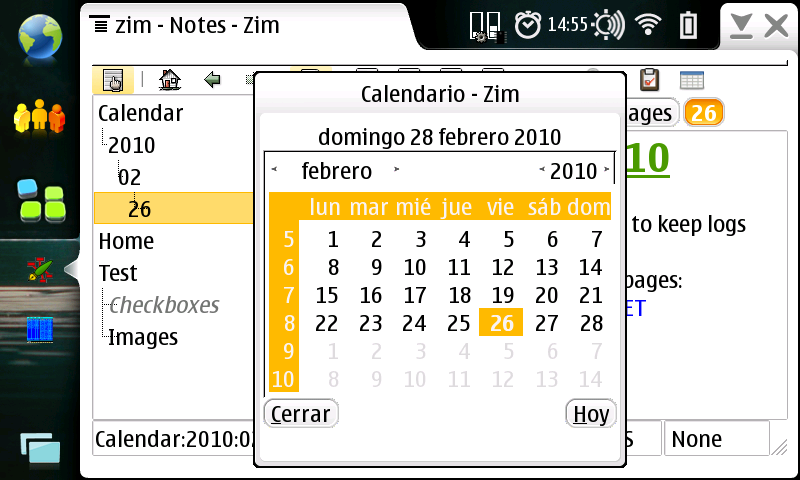 Zim is incredibly useful notepad like desktop application that is inspired by the way people use wikis. 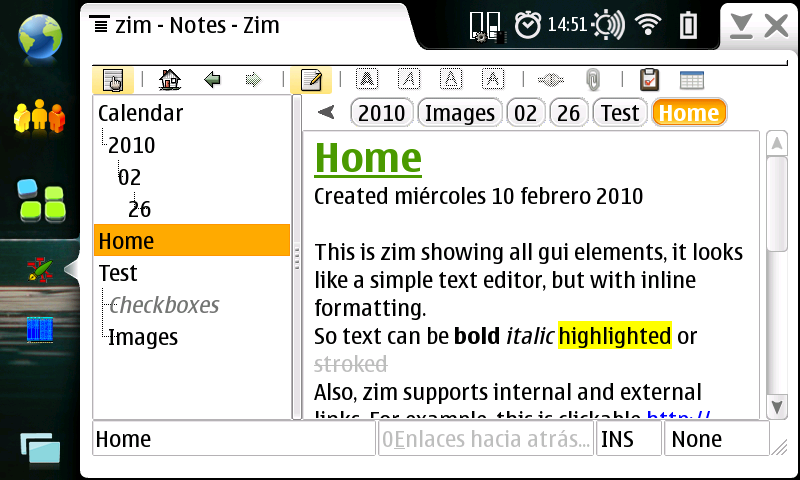 The zim homepage is http://zim-wiki.org. 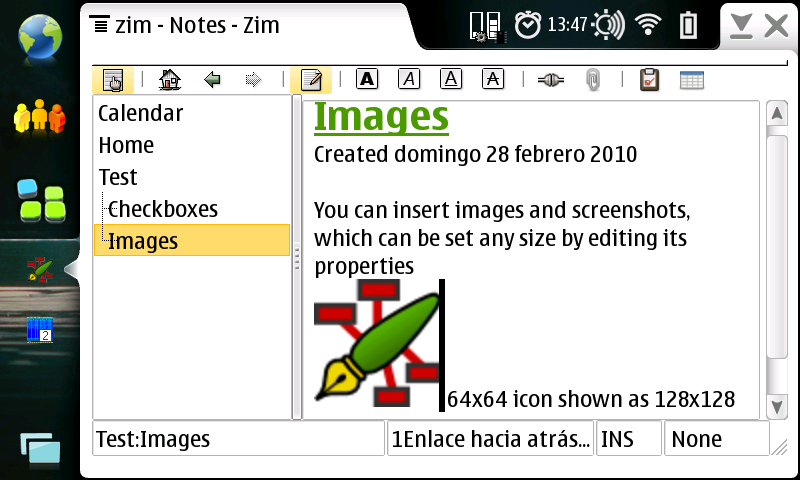 On the screenshots page you'll find a screencast of zim in action. 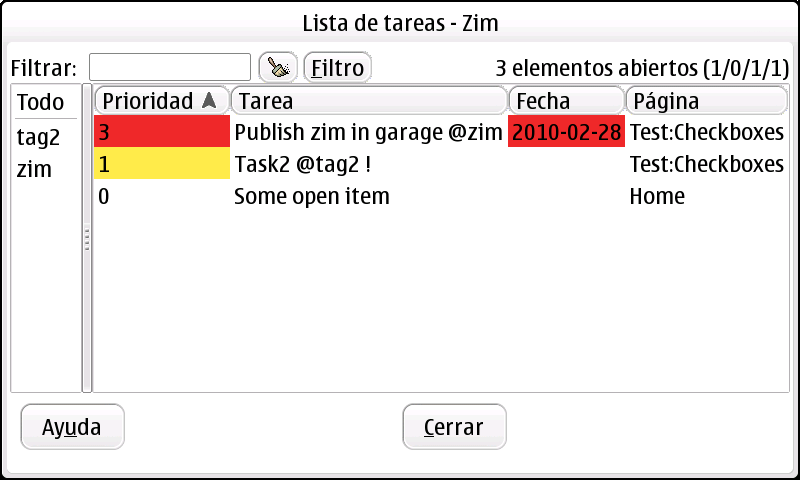 With Zim you'll be able to keep track of TODO lists or ideas, to take notes during a meeting or to draft any other kind of text (blog entries, important mails, etc). The tree of documents is created on the fly as you type, new pages are created by just typing a link. Pages are hyperlinked each other, and the system keeps track of which pages link to a given one (backlinks). Zim keeps of your way, you even don't have to worry about saving, it autosaves on the fly as you go editing your documents. 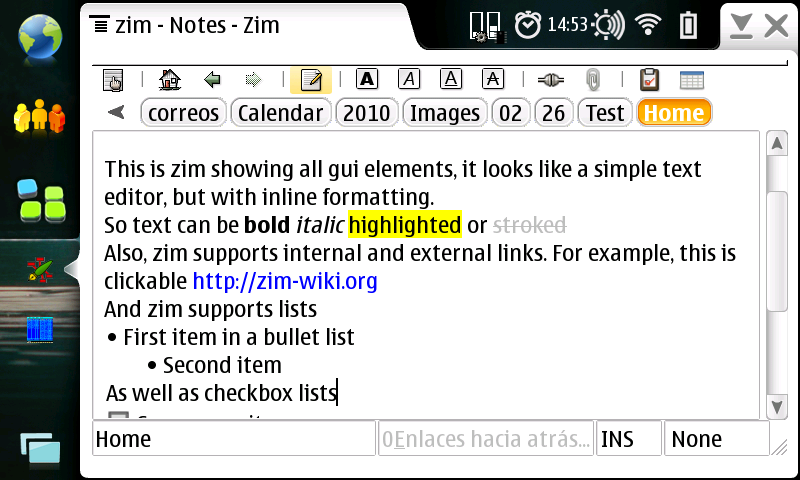 Notebooks can be exported to html for publishing; this page has been created with zim. 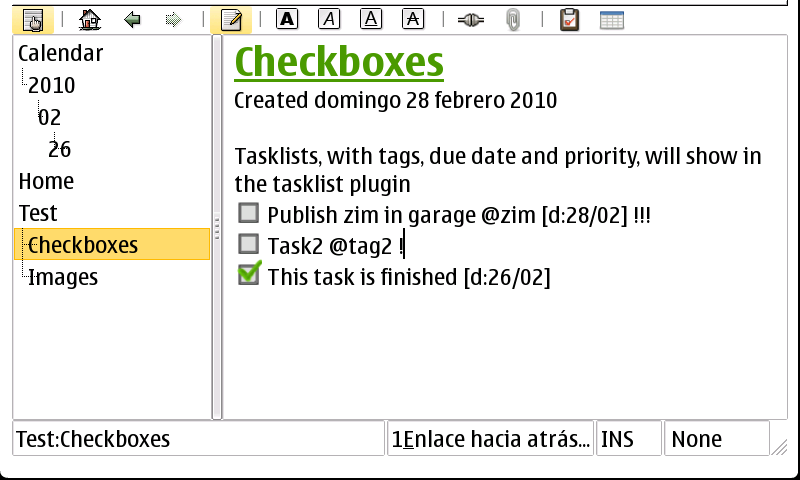 Some key features are provided with plugins, like the calendar plugin, which allows to create calendar pages to keep a log of what you have been doing, and the task list plugin, which keeps track of tasklists created with checkboxes. This is the maemo port of zim. The port is targeted to maemo 4 Diablo (N8x0 devices), but works without problems in maemo 5 Freemantle (N900 devices). This is a work in progress, and there are still some issues, but it is already fully usable. 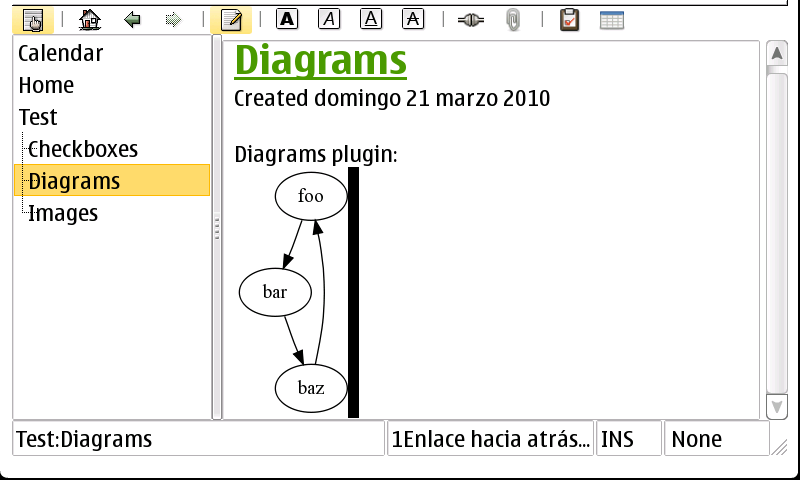 GNU R: for "Insert GNU R Plot" plugin. Available in the maemo extras-devel repository for N900 users as r-base package. Available for N8x0 in its garage page. If you find a bug, make sure it doesn't happen in your PC too. If it does, it is a zim bug and not specific to the maemo port, and you should report it at the zim project homepage. The panel can be hidden, as any other widget.